Despite recent efforts by the International Civil Aviation Organization to curb greenhouse gases from air travel, the High North will likely continue to see increasing emissions. Unlike the Arctic Ocean, which may serve as a future shipping corridor, the skies 9,000m (30,000ft) above have already become a popular shortcut for international transport. What is the impact of growing air travel on the region’s environment – and what does the future hold? Prior to 1999 virtually no flights passed over the North Pole or across the High Arctic. During the Cold War, flights over what was then Soviet territory were off-limits. Since a limited number of demonstration flights began in the late 1990s traffic across the region has grown exponentially. Several hundred flights per week travel from Asia to North America and vice versa along the four major polar routes. By 2011, more than 5,000 flights were crossing the North Pole annually, bringing with them increased greenhouse gas emissions to the region and the dangers of black carbon to the Arctic sea ice below. Air travel represents the fastest-growing emitter of CO2, accounting for around 2 percent of global emissions. However, as the emissions occur higher in the atmosphere, indirect effects, such as the formation of cirrus clouds, which can trap heat, increase the industry’s impact to an estimated 5 percent. And global air traffic is rapidly growing, transporting close to the equivalent of half the world’s population, around 3 billion people each year – a figure likely to double in the next 15–20 years. The International Civil Aviation Organization (ICAO) expects emissions from air traffic to increase by 300–700 percent and by 2035 could account for more than 20 percent of global greenhouse gas emissions. The ICAO, a specialized agency of the United Nations, has long been reluctant to implement any kind of mandatory emission reduction programs and international air traffic has been exempt from emissions control schemes such as the Kyoto Protocol and even the recent Paris Agreement. Furthermore, national air traffic, which accounts for 40 percent of all flights, is not covered by any comprehensive agreement. As a result of the industry’s refusal to reduce its carbon footprint, emissions from air traffic have doubled since 1990. Finally, at the ICAO meeting a few weeks ago in Montreal, Canada, representatives agreed to begin the process of curbing emissions from international air travel. However, their efforts fall far short of what environmentalists and activists, such as the International Coalition for Sustainable Aviation (ICSA), had hoped for. During negotiations on the aviation agreement, key provisions that would have put it in line with the Paris Agreement to limit the global temperature rise to below 2C (3.6F) were deleted, according to the ICSA. In essence, airlines agreed on an emissions reduction scheme that will not see mandatory emissions reductions before 2027. The European Union, United States, China and Japan, however, aim to participate in voluntary measures prior to 2027. The emissions reduction efforts are primarily focused on efficiency measures that would come from improvements in technology, such as improved engine efficiency and lighter airframes. However, these developments were already occurring in the latest generation Airbus A350 and Boeing 787 jets, as airlines have been pushing for fuel cost savings. The proposed reductions are also achieved through offsets, such as planting trees, while not actually reducing emissions. Furthermore, airlines are able to purchase emissions credits from other economic sectors, which are not infrequently located in less economically developed countries. Polar routes have come a long way since initial test flights by the Russian government began in 1994. 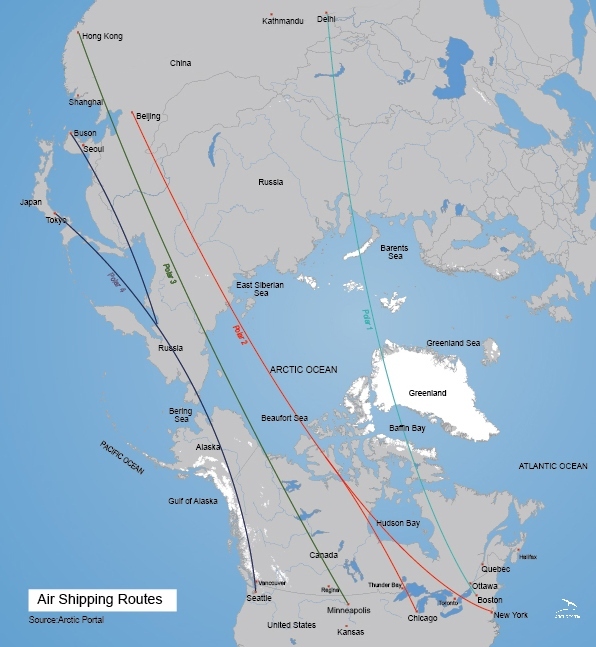 By 1998, four polar route corridors had been defined and airlines began demonstration flights in July 1998. The four polar routes beginning and ending in Russian airspace provide shorter and more efficient routing between North America and Asia and the Middle East. Polar route 1 serves as a connector between West Coast hubs, such as Los Angeles, San Francisco or Vancouver and the Indian subcontinent and the Middle East. Polar routes 2–4 connect major hubs such as Chicago, Atlanta and New York with cities in China and East Asia. In order to allow for flexible routing the flight paths are connected via a series of crossover routes. In addition to flights over or near the North Pole, up to 1,000 flights between Europe and Asia and Europe and North America traverse the Arctic Circle every week. By 2010 a total of more than 50,000 flights entered the Arctic each year. While flights across the Arctic account for only a very small fraction of global emissions from air travel, their local impact is significant. Especially damaging to the sea ice below are black carbon emissions, commonly known as soot, which within seven days fall out of the atmosphere and settle on the ice below. Once on the ice these little particles absorb the sunlight and act as microscopic heaters, slowly melting away the ice. In fact, scientists think that black carbon is one of the factors that explain the rapid loss of sea ice over the past 20 years. How much does aviation across the Arctic contribute to the region’s emissions, including black carbon? More than 80 percent, according to a study by Mark Jacobson, director of Stanford’s Atmosphere and Energy program, that looked at the impact routing aircraft around the Arctic Circle had on Arctic and global climate. Flights across the Arctic have seen unprecedented popularity. Flights from new global hubs, such as Dubai or Beijing, to any destination in the United States or Canada now often route across the Arctic. United Airlines alone offers around 100 flights traversing the Arctic per week. And such traffic is all but certain to grow over the coming decades, as traffic between North America and Asia is expected to grow more than any other intercontinental air traffic. And while ICAO’s modest efforts to control or offset emissions may begin to bear fruit once they become mandatory, they do little to reduce the dramatic impact of localized emissions occurring over the Arctic. This article was originally published by High North News and is reprinted here with permission.